This season’s World Cup Dressage has shown us some of the most exciting freestyles to date, with up and coming stars throwing down the gauntlet for established names like Isabell Werth, Edward Gal and Patrik Kittel. 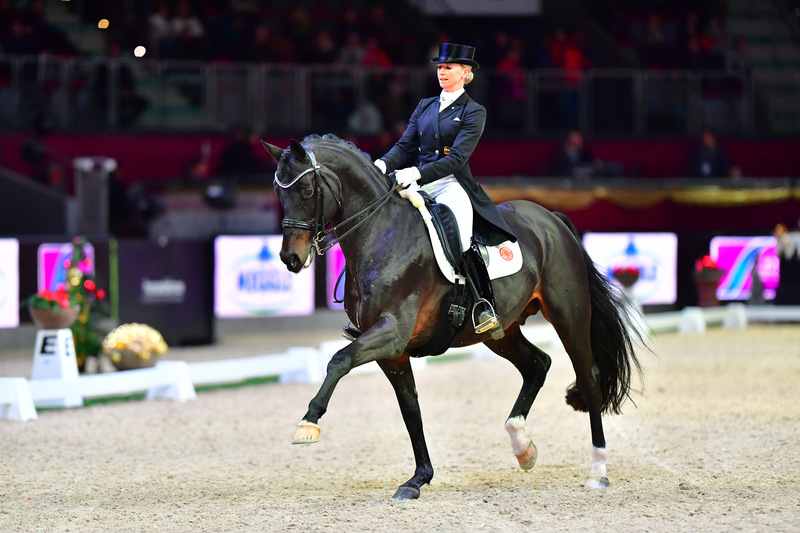 The most decorated Olympic rider in the history of the sport and reigning World Champion, Isabell Werth, was back again this year showing absolutely no signs of slowing down. Competing a total of three different horses including her fabulous Olympic and Omaha mare Weihegold alongside geldings Emilio and Don Johnson FRH, she and her team were in great form. Werth did particularly well on Dutch soil with a win at the January qualifier in Amsterdam with Weihegold, and another win in the last qualifier of the season at s-Hertogenbosch aboard Emilio. She was also victorious on home soil in Stuttgart, also riding Weihegold, and in Lyon with Emilio. Gal, of Totilas fame, showed that he’s absolutely not a one-horse wonder and must have been very pleased with the progression of Glock’s Zonik. While they did not clock a win, they did pick up a few second and third places across the season – promising results, given that stallion is still quite inexperienced at this level. Another Dutch hopeful in Paris would be Madeleine Witte-Vrees, who consistently finished in the top five riding her stallion Cennin, with a couple of third-place podium finishes across the season too. Werth aside, the German riders in general performed well, with Helen Langehanenberg winning the Neumunster qualifier in February, but she will not be competing in Paris as she is pregnant. She was followed closely in Neumunster by her compatriot Dorothee Schneider, who was victorious at the Austrian leg of the competition in Salzburg. There’s also Jessica von Bredow-Werndl in the mix, who picked up a couple of second and third places at various qualifiers. She looks destined for a top-10 finish. It was popular Swede Kittel who finished top of the qualifying group in the Western European League. He gave Werth a run for her money at times as he wowed the crowd across the continent, and went home with a fairytale win at London Olympia - edging British finalist Emile Faurie - and third places in Lyon, Herning and Gothenburg. Another Scandinavian who pushed Werth hard was Cathrine Dufour, and while the young Dane is not participating in Paris, it would be remiss to ignore her contribution to the 2017/18 season. She had a couple of standout performances with Atterupgaards Cassidy, including a sensational display at the penultimate qualifier in Gothenburg in February. Her flawless freestyle not only earned her 10’s from all five judges for difficulty, but also gained her an 88% and a convincing win over her competitors. On the other side of the pond, the standout for the season was Laura Graves, another young rider who has had a meteoric rise to fame over the last couple of years. With her horse Verdades, affectionately known as Diddy, Graves has been making waves in the dressage community lately. A quick look at the final rankings ahead of Paris shows her average at 8% higher than her nearest competitor, Shelly Francis. Others who have performed well in America recently include Brittany Fraser and Ashley Holzer, although neither makes the trip to Paris. With her scores regularly soaring into the 80s, Graves could well be a threat to some of the European league riders. While it will be a tough battle for her, especially after a long journey to Paris, she stands a real chance of coming home with a medal this week. Many consider Werth and Graves to be certainities for the top three, but the level of talent on display in Paris means anyone has a chance of making the podium.